Lee is the author of "Lost Hearts in Italy." Photo by Paolo Sacchi. Lee’s first novel in 20 years, “Lost Hearts in Italy,” explores the geometry of an ill-fated love triangle that begins in Rome, moves forward in time to Turin, and counts any number of luxurious European settings. Betrayal and deception lead Americans abroad to fall from innocence. A feeling of being adrift thrusts the novel’s naïve central character, Mira Ward, into a torrid affair with a predatory older Italian billionaire. The reader enters the timeline of the story backwards, beginning with the end of the affair. 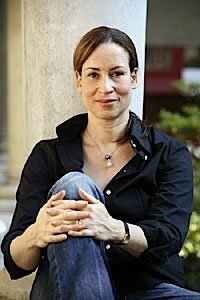 Other critics were less generous, however, with The New York Times assailing her “somewhat tired tropes.” Times of London literary editor Erica Wagner, who reviewed the novel for the paper, said of Lee’s characters, “I kept wondering why I was bothering with these people …” (See review under Book Club, home page). The expatriate condition surfaces in virtually all of Lee’s books. It is not only one of her favorite subjects, but also an autobiographical trait. Born in Philadelphia and educated at Harvard, Lee has lived in Turin for over a decade. Not even her adopted home keeps her in one place. She often spends long periods in Madagascar with her Italian husband, her 11-year old son, and her daughter, a student at Harvard. Lee made her acclaimed debut in 1981 with a journalistic reflection on life in the Soviet Union called “Russian Journal.” The book came after a 1978 stint in Leningrad (now St. Petersburg) and Moscow, where she attended Moscow State University (she was 25 at the time). It was nominated for a National Book Award. In 1984, she published her first novel, “Sarah Phillips,” about a young black woman’s Philadelphia childhood. It was also highly praised. Over the years, Lee’s fiction and non-fiction writing has appeared in The New Yorker, The New York Times Magazine, Vogue, Time and The Oxford American. She’s fond of the short story form and her novels are constructed mostly from episodes. She cites Australian novelist Helen Garner, who often shifts lyrically between characters and between present and past tense, as an influence. In “Lost Hearts,” Lee says she aimed “to explore an impressionistic style” — she was reading Garner’s 1984 “The Children’s Bach” at the time — “and the possibility of saying a lot with a few words and through many voices.” Milena Vercellino chatted with her. Was “Lost Hearts in Italy” your idea for the novel’s title or was mentioning Italy a way to make the story more attractive? Italy affects me through its physical beauty, its sensuality, and its past. And it found its way into my writing. It creeps in. It’s hard to keep it in limits, not to get into clichés. It’s very difficult, there is always the risk of becoming banal. Many foreigners have an idea of Italy as absolute paradise. “Under the Tuscan Sun” is a wonderful book, but also a warning for writers: you should not gush about the complete beauty of Italy. Your books seem to have a kind of Hemingway geography: for him, mountains are safe; cities and flatlands are dangerous. You seem to suggest Rome is corrupting and the north a more subtle and survivable place. I don’t see Rome as a particularly dangerous place. If this impression comes through, it’s probably because in “Lost Hearts” Rome is the first gate to Europe for the naïve couple. As for how northern Italy is portrayed, I think it seems different because of the time span between the first part, set in Rome, and the second part. Everybody gets older, more accepting, more experienced. They know that they are able to survive. Many foreign observers of Italy say that next to nothing changes socially and politically here, but what’s your sense of the difference in this country between when you arrived first and now? Is Italy progressing? In general, I don’t think you can talk about progress. In the U.S.A. I see no progress. We are back to a 1950s mentality. In Italy, I see superficial changes, but I think that deep down inside everything stays the same. The young people here are the most conservative I know. They are not willing to leave their parents’ home and look for adventures — I don’t mean sexual adventures, but ways to change their lives. In Italy, public, civic life is less important than family life. This hasn’t changed one bit. Also, the role of women in Italy bothers me, but I don’t see a real alternative at the moment. How do you view the difference between being a writer in Italy and in the United States? I don’t think there is much difference. A writer’s job is to comment on what’s around, to tell stories. It’s the same in every culture. Maybe once, because reading was less popular in Italy, it seemed like a more elite activity. Maybe that was true 15 or 20 years ago. Since Italy has become more involved in a global dimension, Italians probably tend to read more. What does it mean to be an African-American writer in Italy? It all comes together. In America, especially if you are a person of color, you feel apart from an ideal “American.” You feel a bit foreign. So it felt quite familiar when I came to Italy. Being African-American made me feel more comfortable as an expatriate. I knew what feeling apart meant. Being a writer also means feeling apart, because you have to take a step back to look. So it all ties together: being African-American, being an expatriate, and being an artist. Do you feel your work is connected to the 19th century legacy of American expatriate literature, starting from Henry James and Edith Wharton? Not deliberately. As somebody who loves literature, I love expatriate literature, so I think I have on some level been linked to it. I don’t think I have taken ideas from it, but certain experiences and themes are the same. I think of certain stereotypes of American ingenuity and European experience in expatriate literature, the jaded American in Europe. It does reflect the truth in some way. I have seen my own naïvité coming to Italy. It’s a matter of having different views: when you grow up in a country that is new, everything seems possible. In an old country with a long tradition, on the other hand, you feel tied. But tradition is also a resource. It directs you. My writing echoes the themes of many expatriate writers. I feel drawn to books about expatriates. Isn’t being an expatriate a less extreme experience today than it was, say, a few decades ago? You don’t have quite the feeling of going to another planet, but it’s still very interesting and intriguing. Turin is like Philadelphia; it is deeply provincial, inward-looking, hidden and mysterious. But it doesn’t seem a good city for writers: look at what happened to (Emilio) Salgari, (Cesare) Pavese and Nietzsche! I also spend long periods of time abroad. My husband and I built a house on an island off Madagascar [editor’s note: a former French colony in the Indian Ocean off east Africa] and spend a lot of time there, especially in the summer. Is it a satisfying place to write? It is. My next book is going to be about foreigners in Madagascar. Madagascar is the ultimate place for being an expatriate. It’s a remote place, where people go to get lost. I am very interested in cultures that clash. It moves me. In Madagascar, it’s the American and the African, here it’s the American and the European. Being in Madagascar is kind of going beyond Italy. Do expatriates really run away or are they exploring their own culture from the outside? It depends. Everybody has his own reasons. People do run away from things, but I think that people who go to very remote places dream of freedom, of everlasting “good places,” of paradise. It’s a dream of escape, it’s Rimbaud: là-bas. It’s about leaving your ordinary life behind. For me it was curiosity and dreaming. When you are abroad, you always think that some kind of secret is going to be revealed to you. Do you prefer reading American or Italian literature? I’m a writer but also a foreigner, even if I have an Italian husband and family. But writing is a solitary pursuit. I try to keep my English by reading the classics. I also love Russian literature, especially Tolstoy — “Anna Karenina” is one of my favorite books — and Bulgakov. Another book I love is “Kim,” by Kipling. It’s about identity, a topic I am very interested in. And Trollope, a very good writer to read when you’re writing. I often go to the U.S. to visit my brother in San Francisco and I always pick up books to bring home. I’m currently reading a book by a Moroccan-American woman writer, Laila Lalami, entitled “Hope and other Dangerous Pursuits.” Next, I have “Women Without Men,” by Sharnush Parsipur. I try to find books about the state of being away, being apart. I take my son to school, then write until the early afternoon: 9.30 a.m. to 3.30. Then I run my errands, make calls to New York, speak with journalists. I prefer writing in the morning. A collection of short stories, which I am already writing. They’ll be published in The New Yorker first, and then collected in a book. The last one was “La Ragazza,” set in Turin. It was published in The New Yorker a year and a half ago. Then I stopped writing short stories for a while because I was writing “Lost Hearts.” Now, as I mentioned, I am beginning a book on Madagascar, which will be published after the collection of short stories. Will “Lost Hearts” be published in Italy? No, I don’t like having my books translated in Italian because I write about Italy. I told my agent “Lost Hearts” won’t be published in Italian. But “Interesting Women” was translated into Italian. Why the exception? My life is a little bit like being a spy. Even my husband, who doesn’t read much in English, doesn’t really know what I’m doing. When “Interesting Women” was published in Italian, I felt that suddenly I had been revealed in Italy. I don’t know if I want to do that. Laila Lalami: “I’m reading ‘Hope and other Dangerous Pursuits.’” Lalami is a Moroccan-American writer. Born in Torino, Milena left her hometown out of curiosity when she was 17. Pursuing her studies (mostly philosophy and economics), she has lived in the United States, China, and several European cities. She got back to Italy just in time to take part in the 2006 Turin Olympics as a journalist. At present, she works as an intern for the Associated Press and freelances for various magazines, covering a topics that include sports, society, entertainment, and the arts. She has too many interests and a few passions.